The performance and quality of a marking mainly depends from the output power and the laser beam focus. 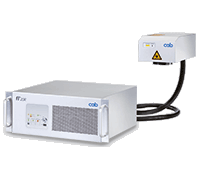 cab FL+ marking lasers are diode-pumped and air-cooled. They have high beam quality and pulse peak power. Laser source output powers are from 10 to 50 Watt. Different plano-spherical lenses allow marking in fields from 69 x 69 to 290 x 290 mm. Marking is possible on plastics and metals as well as on coated surfaces. FL+ marking lasers consist of two units: The control unit has a laser source already integrated. The scan head is connected to the laser source via a fiber. It may be assembled in all possible position. The control unit with the laser source are incorporated in a 19’’ rack. Lenses are available for marking fields of various dimensions. The smaller the marking field, the higher the resolution. Laser Integration in Production Line with 5 - Axis Robot. Never has laser marking been so easy! Laser marking "out of the box"
1 Ethernet 10/100 Base to connect a PC. As delivered, the device has been configured with an IP address or in DHCP mode. 2 Ethernet 10/100 Base to connect periphery. Bidirectional data transfer to end devices is enabled. 3 + 4 2 x RS232 C to connect periphery. Bidirectional data transfer to end devices is enabled. 6 Remote to switch on the laser as well as for monitoring. 7 Interlock/E-Stop to integrate to external safety circuits and to connect an external E-stop. They allows precisely positioning the scan head. It allows positioning of the linear and rotary axes via the RS232 or digital I/O interface.